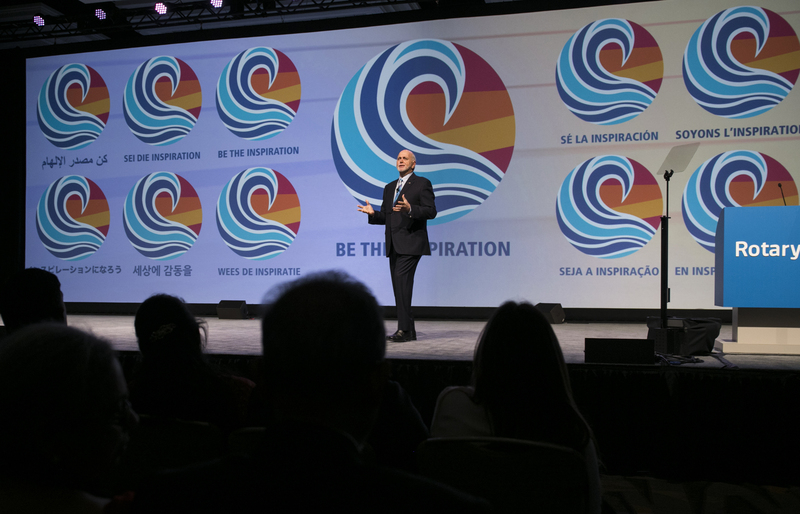 2018-19 RI President Barry Rassin announces his presidential theme, Be the Inspiration, at Rotary's International Assembly. District Governors are greeted with the rhythms of Drum Café, an interactive drumming group, and with drums for an inspiring participatory experience. Drumming unites the attendees as a universal language at the opening night of the International Assembly in San Diego, California, USA on Sunday. Rotary International President Ian H.S. Riseley welcomes the District Governors to the International Assembly in San Diego, California, USA on Sunday. Rotary International President-elect Barry Rassin pays tribute to Rotary International President-elect Sam F. Owori, who died unexpectedly last year due to complications from surgery. Rotary International President-elect Barry Rassin and his wife, Esther. Drum Café, an interactive drumming group, leads the audience in a drumming exercise to build the excitement.